Blender caught up with everyone’s favorite alterna-alien on her recent North American tour. Spacey ? Sure. But, even on the brink of mainstream success, Björk remains strangely grounded. It’s two weeks before Björk is scheduled to perform at San Francisco’s Warfield Theatre. And through the power of internet group therapy, my e-mail pals and I are processing some ominous news. We’ve all heard that an Icelandic blizzard has delayed the first leg of her American tour. That her opening gig in Dallas has been canceled. That they were pulling bodies out of the snow as she drove to the airport. That the harsh reality of a snowstorm which devastated her hometown has made her rethink her priorities. (“I felt so guilty. I felt so terrible,” she says.) That it’s possible she might give up music altogether. We wonder if she’s even going to make it. But two weeks later, Björk starts her San Francisco show on the dot of 11.30, curled up onstage like a present under a Christmas tree. Her hair is straight, pulled slightly forward, and the strain of touring is visible on her face as she works her way through a repertoire of now-familiar songs. Her band are a scruffy rearguard of techno-mercenaries, perched behind a synthetic foliage of five foot high metallic brambles which encase their drum kits and keyboards. The brambles fill the mid-ground between Björk and three synthetic tree sculptures framing the event, and strobes of light are fired into the audience high up from the branches. The back wall hosts a thirty foot screen, ablaze with intermittent projections of light as texture. It’s a high tech gig. 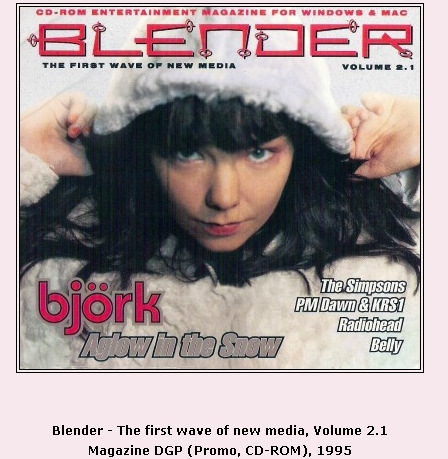 Björk Guðmundsdóttir was born on November 21, 1965, and was raised by Icelandic hippies. Her name has done more for Reykjavík than the Olympics did for Lillehammer, her function-as-form style informing the aesthetic of techno-youths throughout the world. Those Princess Leia hair buns ? Just a way, she says, to discipline her hair during karate practice. Her left arm bears the tattooed symbol of an ancient Viking compass, and she says it instills her with a sense of direction. Following the success of the Sugarcubes, she exchanged her wintery home for the bustle of a London apartment and although she misses the fierce nature and social privacy of Iceland, she’s determined to push her artistic potential to the limit in this new environment. Part of her creative assault includes a fetish for technology, and with a little help from such friends as Tricky, 808 State and demon.co.uk, she’s already developing an impressive internet presence. Her homepage is built around a neat interface featuring button icons representing her six senses. Six ? Yep-as well as sight, sound, touch, smell and hearing, Björk’s homepage explores the least discussed of the human senses ; intuition/E.S.P. On any other artist’s website, a sixth-sense shtick of this nature would seem kind of contrived, yet Björk somehow manages to get away with it, as her whole sense of being seems so other-worldly. In person, Björk is no pixie. She has a parochial London accent and speaks English with only the slightest trace of an Icelandic lilt. Away from the stagelights, the orange eye makeup and fairy dust speckling her cheeks looks almost ordinary. She’s been in the public eye for the best part of twenty years now, and has been asked every question there is to be asked. When it comes to publicity chores these days, she’s gracious. She’s great in front of a camera, autopiloting her way through eight rolls of film, effortlessly striking poses while her mind is obviously elsewhere- pulling bodies out of the snow in Reykjavík maybe, or waiting for news of the survivors. hands her a cover-story copy of UHF—featuring a six page photo spread she shot earlier in London-and she reads the magazine cover to cover instead of turning straight to her pages. She somehow manages to be interested in everything, yet is caught up by nothing at all. Her first solo album Debut sold 2.5 million copies, her follow-up, Post, is presently nestling in the higher rungs of the Billboard and College Music Journal charts, and she’s assured of filling any large, non-stadium venue in any city of the country. We’re familiar with her songs, with “Human Behavior” from Debut, with “Isobel” and “Army of Me” from Post, and when she performs an acoustic version of “Venus as a Boy”— backed only by a sparse piano—it’s the highlight of the evening.